Noticing clouds formation can be the best past time for anyone. They surprise you when you find a formation which you have never seen before. The naming of different types of clouds follows one pattern. The meteorologists name them with respect to their looks and their height above the ground. 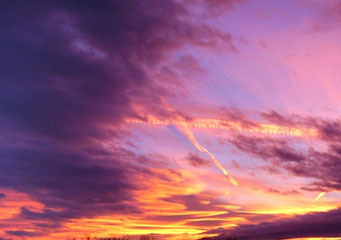 The first part of the clouds' names is usually associated with their height while the second part of their name indicates the shape of the cloud. Clouds are also classified under several categories that include high level clouds, mid-level clouds, low level clouds, vertically developed clouds and low to medium level clouds. If you are interested in getting some basic information about clouds and their types, there is a lot of material available on the internet. Pictures have been uploaded for better understanding and you will have a wonderful time in learning something totally different. What are stratocumulus duplicatus clouds? The word stratocumulus is mainly derived from two Latin words: stratus and cumulus. Stratus means spread out or layered whereas the word cumulus refers to heap or a mass of an object. Thus, the word Stratocumulus gives an idea of the appearance of Stratocumulus duplicatus clouds. It is basically a low level cloud and is visible in the form of layers. The layers are quite close to each other and if you see them closely, you will get a feeling that the layers are tightly packed in two with one above the other. How are stratocumulus duplicatus clouds formed? Condensation and air are the two main factors that play an important role in the formation of stratocumulus duplicatus clouds. They are developed from cumulus clouds and look very similar in their texture and composition. The only difference is that duplicatus clouds are formed in layers where cumulus clouds have a puffy appearance. They are usually visible in the evenings when there is not much vertical movement because of convection. This is how they become lose and spread horizontally. What height are stratocumulus duplicatus clouds found? The word, stratocumulus is basically a Latin word which is derived from two further Latin words: cumulus and stratus. Stratus means flattened therefore it is quite evident that do not show vertical progression and remain at a low level. Under ideal condition, they are only two thousand meters high above the ground level. They are not thick as well and can be easily identified from their base. If you feel that their bases are not identifiable any more, it clearly means that they have been transformed in to some other type of cloud. What stratocumulus duplicatus look like? These clouds are usually mixed with altocumili because of their close similarity. You can easily distinguish the two types of clouds by examining their size. Simply point your hand in the direction of the cloud and see whether it is the size of your thumb or not. If it is, then they are altocumulus clouds. Stratocumulus duplicatus are usually of the size of an individual’s hand when pointed in the same way. How common are stratocumulus duplicatus clouds?